A very foggy trip down to Toulouse this morning to catch a flight to Madrid. For some reason Bordeaux to Madrid by plane or train is almost impossible to do without a week off! Tomorrow I am invited to the Lallemand conference where I will be also judging wines. Lallemand are the innovative makers of wine products including yeasts and enzymes and I have been experimenting with prototype yeast strains on some barrels with fantastic results. With so many different wines, the Chai is the perfect place for this type of experimentation. My meticulous tasting notes from fermentation to bottle have played a hand in helping to develop better yeasts for different grape varieties. 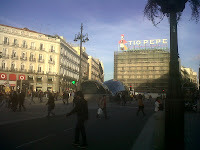 Spain lived up to my blog title as I arrived to a very warm and sunny Madrid. Manuel the taxi driver was the probably not only the oldest taxi driver on earth but the oldest man I have ever seen on earth. He was great. He knew the city like the back of his very wrinkly hand but concentration on the road was not his best asset so it was quite a hairy ride into the centre. Maybe he learnt to drive when cars only had two gears and traffic lights didn't exist because he only changed gear once the whole way – only after he cut up an ambulance – and went through about 11 red lights! He must go through brakes and gear boxes like the Spanish go though ham! As I said Manuel knew everything about the city but dropped me off at the wrong hotel ... mine was another 15 minute walk. I'm meeting up for dinner with some fellow friends and winemakers from all over Europe tonight. Or to be precise, we’re meeting for dinner and more than likely an argument about wine yeasts! Oh and a big Happy Birthday to my dad today!